1. Preheat oven to 200ºC, gas mark 6. Cut the tops off the garlic bulbs, drizzle in olive oil and season generously. Wrap in foil, place on a baking tray and roast for 45 minutes until tender and caramelised. 2. Meanwhile, make the pistou. Tear the basil into a large pestle and mortar or food processor then pound together with the garlic and a little salt to form a paste. Add the tomatoes followed by the olive oil and continue to pound until a thick sauce is formed. 3. Cut each of the lamb racks in half, blend the Mediterranean herbs with 2 tbsp of oil and brush over the lamb. Heat a large pan to hot and sear the lamb on all sides until golden and brown. 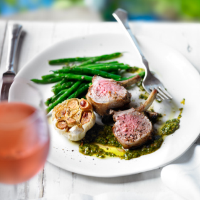 Roast the lamb for 8–10 minutes, leave to rest for 5 minutes and serve hot with the roasted garlic, drizzled with the pistou and accompanied by the dressed green beans.